Universal 10" Tablet Soft Cover Sleeve + FREE SHIPPING! The soft 10" tablet cover is designed to protect your Tablet when it has to go into bags, backpacks, glove boxes or any place where it might come into contact with scratchy things like keys, it completely encloses your device so nothing to get in and attack the screen. With an elastic overlapping flap, it would take a sandstorm to get past these defences! 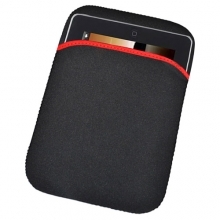 It's constructed from tough neoprene with sewn edges all the way around, and can easily accommodate all 10" tablets including the iPad 2 and the newer iPad Air at 185mm x 240mm (with some extra stretch for slightly larger brands). All in all, it's the perfect casual slipcase for your 10" Tablet! No complaints from us. The order arrived the next day. Excellent service and prices. Would highly recommend you to anyone.